I have firm faith in the up-and-coming Pre-Tribulation Rapture of the Church and see that Scripture teaches this with no alternate. However, I find that some people, who intend to present this message mixing this up with, what I find as, crazy imagery. These bring on disturbing feelings. This is not speaking about joke cartoons that mock the Second Coming of our Lord Jesus Christ. These, naturally, I do not like. Yet, what really bothers me are pictures meant to communicate faith which are even unintentionally misleading. Do the artists and those presenting these depictions realize what people may think seeing them? This can lead to errors in faith and even offend others to unbelief. Firstly, this image, above and on the right is intended to pictorialize the future of seeing God. While I affirmably get this captioned in my mind, the way it does I find unsettling. I feel like I am about to get hit by an oncoming train or something. I am glad that I am ready to meet Jesus Christ in the air, but are you? If you are not ready for God perhaps there will another train coming for you that will send you somewhere else! Is this supposed to be a bridge or a ladder? I can’t tell. This example, as ill seeming as it may be, is still something on target with what the Scriptures teach. Though, is there an actual staircase or road to what lies beyond for us, beginning the next life? Other pictures about eternity and the Rapture commonly get even worse. This picture, while less unsettling, I find absurd. 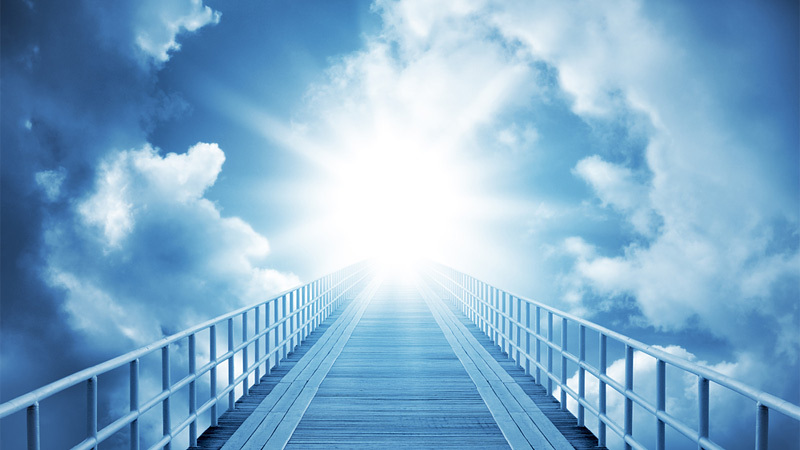 Will a man be still playing his guitar while going up in the Rapture? At least he gets to bring it with him. It seems that these kids are having fun in the lightning playing Superman. How amazing they have time for all that when, in reality, this happens in a “twinkling of an eye”. No problem for them since they will want to grab the hand of a family member before it’s too late. Don’t forget to pack a backpack ahead of time and put it on before you go. Wait a minute! Is that a NUN? 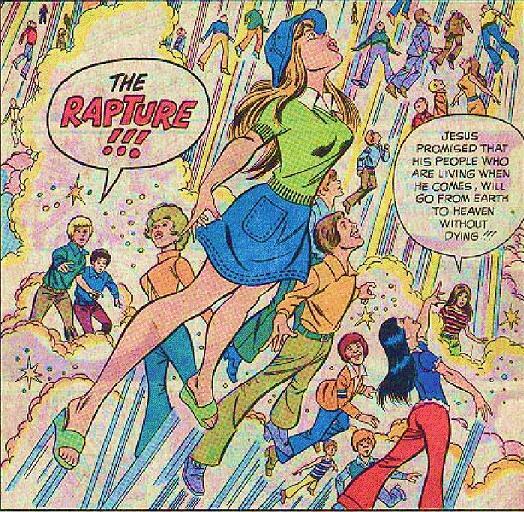 This cartoon was really meant to explain the seriousness of the Rapture as illustrated by the young woman still standing in the world who was left behind at the very moment it happened. Yes, this woman, who is speaking, knew so much about Jesus, and was apparently convicted of Him and ready to share. Why didn’t she believe in Jesus and go up? Seems rather odd. It seems as though that she has more faith than the boys and young men going up to meet the Lord while they are staring up the blue skirt of the other young lady. The young men left behind could have easily done that but were more surprised about the event of the catching away of the saints. Did you notice that those saved here are only white people? At least they all still get to wear their worldly clothing while they go up into Heaven. Are their pockets still full? How is it that you picture in your mind about the Rapture of the Saints? Is it the Biblical one? In this picture about the Rapture, the clothes of those snatched from the earth do have their clothes left behind. Also, it is a relief to see that black people also get caught away but still in this drawing it is only blacks. That’s not much better than the previous illustration. Yet, maybe they will find it a surprise that the angels are white? By the way, who draws there pictures? Who do these artists want you to believe will go up in the Rapture who gets left behind? Yes, even biased pictures are not hard to find on this topic as you can see for yourself. 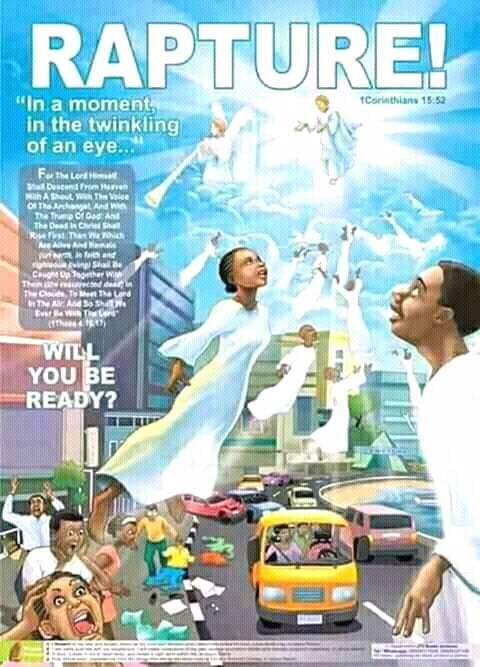 On other pages of ours we present Holy Bible verses that teach the Rapture. When you add matters together it become clear that it happens before the Tribulation. The best picture about the Rapture you can get is the one the Holy Scriptures themselves will show you. How to you picture the Rapture in your mind? How do you imagine it will happen? Is what you imagine how the Holy Bible teaches the Rapture as? The Rapture indeed is coming, real, and pre-tribulation. Do you understand the Rapture clearly or have you been confused by other ideas? Do not let yourself be deceived by strange notions. Jesus comes to take us to meet Him in the air. Do you trust in Jesus Christ to save you from your sins and give you the free gift of everlasting life? Here they go, staring up skirts again!